Johannesburg - The Southern African Music Rights Organisation (Samro) is housed in an uninteresting building in Braamfontein. But it happens to be the place where your favourite music is logged and registered so that it’s legal and paid for. Now, the side of the building facing the M1 highway at the Smit Street off-ramp has been given a face-lift in the form of a beautiful mural of a black woman with an Afro, called Boniswa. Set against a yellow background or primer, the piece jumps out at you as the bland wall makes the fresh piece pop. Somehow the mural comes across as having been part of that wall since it was built. Graffiti artist Breeze Yoko used rollers and spray paint to do it and had to stand on a forklift and scaffolding to reach the peaks of his work. Samro spokesperson Andile Ndlovu tells #Trending that they’re in the middle of a major re-branding exercise, which they’ve staggered into phases. “The mural was one of the earliest projects we ticked off. We approached Yoko, a young, black Johannesburg-based visual artist whose work and career we’ve tracked for a little while now. This isn’t the first time we’re seeing Boniswa. The character was conceived in Cape Town a few years back, when Breeze painted a mural on a Table Mountain-facing wall in Khayelitsha. “Fast-forward to 2018 and Boniswa, like millions of us who have left our homes and families behind and migrated to this great city of gold in pursuit of dreams, has landed in the cultural hub of Johannesburg – and arguably of the country.” He’s referring to Samro’s proximity to creative hubs like Newtown and Braamfontein. Breeze was regrettably unavailable for comment. Word is he is currently in France working on a graphic novel. Check out the mural on De Korte Street, Braamfontein. DESIGN OF THE WEEK: A building that does the rights for SA’s legendary music should look the part. 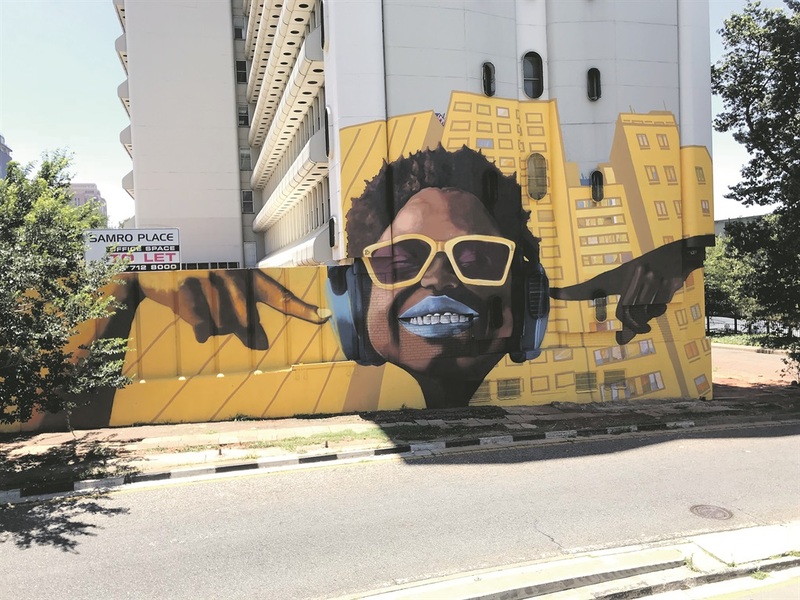 Luckily, the Southern African Music Rights Organisation on De Korte Street has been spruced up with an awesome mural, writes Phumlani S Langa.